German-sounding customer pointing at iMac: Excuse me, is the monitor included with this price? PC World "technician": Ummmmmmmmmm..... I'm not sure. I'll just have to check with someone. Back in the mists of time (about 4 or 5 years ago) I worked in the IT department for a failing healthcare company. My team 'leader' was a fat foolish man who only occasionally came into the office. I didn't really care for the job and I was only there as it was close to home and easy, and I guess I was just lazy. * Tired? Go into the server room and fall asleep behind a rack of servers. Mmmm warm. * Bored? Time to go to the unused office with the contractor and play football with a large roll of tissue paper, or frisbee CD's about the place. * Angry at the failure of a boss? Again with the frisbee CD's only with a bit more thrust. * Simply can't be arsed? Go to lunch 5 minutes after the boss and saunter in about an hour and 45 minutes later, claiming you went just before he got back. Upgrade time! Sending malicious packets to the file server to make it crash, which usually resulted in one of the above, plus putting a request in to the IT director for spanky new hardware with all the extras. It arrived a week later. Result! I'm not sure - does this count as IT? Yesterday I had to call a bod at Tesco Mobile to find out why I hadn't been able to top up my phone in America. He tried to make me believe that my bank wasn't able to receive the transaction request because I was, and I quote, "too far away". This man may not have been an IT bod, but in some way he is licenced to give technical information and advice to customers. And we're talking about the sort of chavs that use Tesco Mobile (myself not included obviously, as I am the exception that proves the rule). Also, my last phone was a clam-shell. It was really god for doing old Star Trek communicator thing impressions. Not that I ever did that. A client once wanted to forward me an email she had received. So she printed off the email, scanned it and attached the document in a new email which she then sent to me. A process, bizzarly, more complicated and technically demanding than locating the 'Forward' button in Outlook. We used to have an IT guys in the office called Mohammed who was a nice enough chap, but it gradually because clear he had a unique approach to IT Support, and indeed life, and was possibly a little bit barking. His approach to most problems was the traditional 'turn it off and on again', but when that didn't work, rather than try anything else, he'd normally just say 'OK, we'll just get you a new PC.' No attempt to sort the problem out - he just told you to save anything you wanted to keep on tan external drive then sent someone down with a new drive. Anyway, the true oddness only developed gradually. It began to become clear that Mo wouldn't answer the phones and would only respond to certain people. If someone he didn't like phoned him, he'd just forward them to another IT guy. This annoyed the other IT guys, as Mo had decided he liked about 20 people out of 300 in the company. I was one of them, and when I phoned him he'd still not answer, but he would turn up at my desk with a cuppa for a long chat (whether or not we touched on my IT problem or not was entirely unpredictable, and I'd often just have to ring someone else afterwards anyway). Also, if he lost interest in a conversation, he'd just walk off mid-sentence, which was a tad un-nerving. I gradually noticed during our chats that Mo was getting scruffier and a little smelly. I found out after a while that this was because he was living in the office, sleeping on the floor in the IT room in a sleeping bag each night. 'It's a bit inconvenient, yeah, but the savings you make on rent are amazing!'. 'Yeah - I got fed up of being Asian so I'm Mike Fish from now on. He left the company soon after. Officially, it was apparently voluntary - nothing to do with him not doing any work for the last 6 months and gradually going off his rocker in full view of everyone in the office. Don't know what really happened as I've never heard from him since. Apparently though, on his last day, he stole the 'mascots' and cuddly toys from everyone in IT's desks and took them to the pub for a drink, where they later needed to be 'liberated' from a drunk Mo/Mike by the Head of IT. I've been on the sick for 6 months, and am being re-trained in work next week to re-join our IT Support team. I've seen it in printed out in both our site's IT departments. I work in IT in a school. It's my last day tomorrow. I/we have a few gems. One is a french teacher with a incredible lack of skill when it comes to computers. The time when she complained her projector isn't working, the other technician went over, looked at the remote, looked at the projector, looked back at the remote and asker her why the hell she was using a HP remote with an EPSON projector. Her reply? "I brought it with me from my room, cause all projectors are the same". Well, news to me. Also, before the summer holiday, we replaced her computer with a snazzy all-in-one thing where the screen is connected to the base unit. It's called and RM One, if you know what they are. The keyboard, mice, network cables and screen cables are CLAMPED DOWN and screwed into the back (this is relevant, bear with me) so it's pretty difficult for them to come out. We were called across because, over the summer, someone had "stolen her keyboard". Now, as mentioned above, it's pretty difficult to take this thing apart to get the keyboard out, so we knew somthing was going on. Went across to the room, looked at the computer desk and PULLED THE SHELF OUT with the keyboard on. "sound isn't working" - unmute it, maybe? finally, "can you fix the internet?" this was by a student. We immediately thought the internet had gone down. But, no, this was her home internet, in a house 10 miles away. Not knowing what OS she had, what her ISP was, even if she was on broadband or dial-up, we couldn't really do much. EDIT: and please please please no recyled joke from a QOTW in 2004 or the ones that have been on chain mail that we've all read. Ta. When I was in my mid-teens, the dentist decided I had too many molars and had to have a couple removed to stop my front incisors from sticking out. After the operation, I was forced to wear braces for a couple of years in order to shift everything into place. You could say that the braces were my eye-teeth support. ...right, now, where's me coat? [09:29:34] Helpdesk says: Hi Rambo :), I've been looking into the issue you raised about the network problems with server t3p862-b. Do you have a spare few minutes so I could come over to your desk and ask you some questions? [09:32:39] Helpdesk says: No, no 'Are you Rambo or not' was not the question I wanted to ask. After this, I didn't hear anything more, I think they gave up. Repost, but it's from eons ago and deserves to be retold. The brother of my best friend at school ran a business computer company in the DOS & Windows 3.1 days. one afternoon a customer who had bought a computer called in. Techy: Are there any messages on the screen? woman: Well, it says my himen has been broken. The phone was subsequently slammed down and the techy burst into fits of laughter, he barely managed to relay the story to his co-workers, who all burst out laughing too. Moments later the phone rang, they managed to regain their composure and answer. The same woman was on the phone. 'Hello? I think we got disconnected, can you help me with my broken himen please? She was helped in the end, but i could never look at Himem errors in the same light again. to the user in question, before fixing it with the aid of Google. I consider myself a techy, but still find Google an invaluable tool in general troubleshooting. -strange error message comes up. Google it - chances are, someone else has had the same problem and managed to fix it. -Think back to the last change you made on your computer before a problem occured - installing a program, changing the resolution, adding a printer. If the two are linked, try undoing whatever change you made and seeing if the problem goes away. -If graphics are going screwy, then a good place to start is the graphics card - update your drivers, restart. 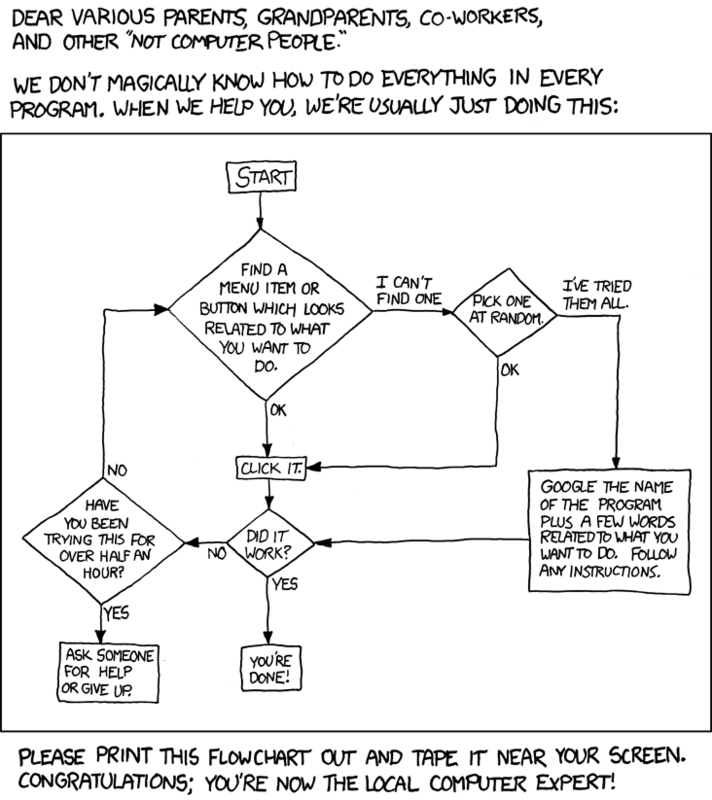 In fact restart first; I know we always say, turn it off and on again, but that's because if fixes 90% of problems. -Strange things happening when you type? Make sure none of the modifier (shift, ctrl, alt) keys are stuck down - start notepad, bash away at all the keys on your keyboard to make sure their not stuck. Customer: Hi, i am having trouble with my mouse. Us: what seems to be the problem? Customer: Well, the pointer thing is in the middle of the screen but my mouse is at the edge of the mousepad. how do I get it so the pointer thing goes further to the side? made us laugh, maybe you had to be there. on another note, a customer had travelled from birmingham to where we were (in east anglia) becuase he couldn't figure out how to plug in his speakers. this was after a lengthy phonecall where i was trying to explain to him that the speakers must have power and the green lead must be plugged in to the green socket on the back. Neither myself or The Culprit can change files on the time tracking themes sub-folder. Unfortunately, The Culprit has added pictures of Nathan W with his top off, tiled no-less, to the background of many innocent users of the tt system. Filled with remorse he attempted to remove them, but now cannot, neither can I. Please can the permissions on the themes folder be restored so that everyone can write to them? i.e. so that work of The Culprit can be undone by others. PLEASE DO NOT do any similar think (‘jokes’) in future as it is not funny at all and we have to reverse all your changes – which takes time. The new Operations Manager was really big on being informed of when things may be going wrong, and so set up the mainframe computer to page him on a pager every time there was a system message generated. Anyway at 4 am the loud beeping of the pager woke him up in a panic. "What could have happened?" he thought. There are 10 types of people in the world. Those who understand binary and those who dont. "It's me job. Can be very frustrating and very amusing. I can fix most problems that don;t require physical tech support over the phone. It's just a matter of finding the level of understanding of the customer without crossing the line into becoming a condescending techy. The big problem arises from trying to work out what the problem is. No matter what the user says the problem is probably something else. "My mouse doesn't work" (The office has been moved round. The users old PC has been disconencted and put to the side to be collected for disposal. The user is sitting at her old desk, infront of her old CRT monitor with a "To Be Disposed" sticker on it's screen, flailing around with an unconnected mouse and keyboard she'd picked up from the rubbish bin. Behind her, her new PC has been connected, powered on and is sitting on her new desk that has her nameplate on)"
I've always had to be pretty much self-supporting. Back in the days of DOS I knew a few people who knew a little more than I did, so when something had to be done I would call them and get tips. This meant that over time I became the IT person for the office. After that I was the one to call them. I'll have loads of stories this week... and I'd like to see Spanky come up with some filth for this topic! Most childish thing I've done? and the last QOTW closed whilst I was still typing, so I'm going to post it anyways. After the cup of tea I just had, I burped for about 3 seconds and then hicced at the end. I then realised what it sounded like. You remember when you used to load a game on a Spectrum? You start the tape and you get a carrier note that lasts about 3 seconds, and then a high pitched squeak as the name pops up on the screen? That's exactly what it sounded like, except an octave or so lower.